Basic foot care is important for anyone suffering from Diabetes, it has many debilitating side effects such as blindness, nerve damage, kidney disease, and amputations if it is not controlled. Diabetes is one of the leading causes of amputations and death today. One of the most serious complications of diabetes is foot ulcers. People who suffer from diabetes commonly develop nerve damage, known as peripheral neuropathy, which leaves them unable to feel their feet properly or with chronic foot pain. 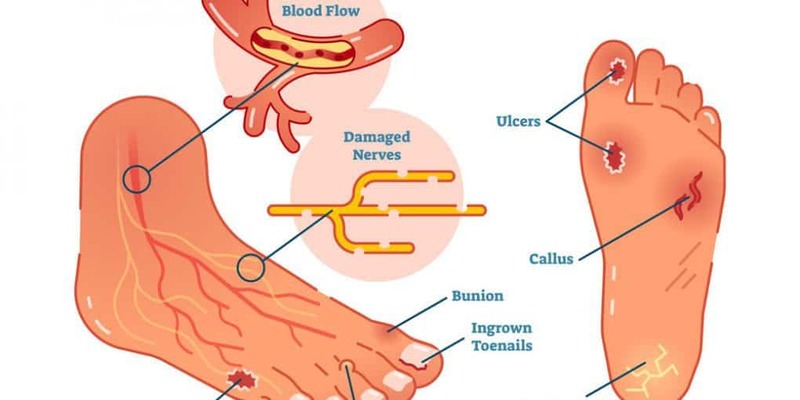 Uncontrolled diabetes can also lead to poor circulation and a damaged immune system, all of which combines to make it difficult for wounds, like foot ulcers, to heal. Any unnoticed rubbing, blisters, corns, calluses or injury can become infected risking more serious complications. There are a number of basic precautions that you can take to protect your feet and avoid the risk of complications. Manage your blood sugar levels carefully and work towards keeping your diabetes under control. Exercise and walk regularly, maintaining a healthy diet. Inspect your feet every day, getting help if you cannot easily see the bottom of your feet. Any damaged areas should be seen by a properly qualified Podiatrist or your Doctor as soon as possible. Wash your feet carefully with soap and water and moisturise every day. Make sure you test the temperature of the water if the feeling in your feet is impaired to avoid burns and blisters. Moisturising your feet will help prevent dry skin and cracking. Make sure your shoes and your socks fit well with no areas of friction, avoiding going barefoot. Be careful when cutting your toenails. If you have neuropathy it may be advisable to have your nails professionally trimmed as you will not feel it if you accidentally cut the skin at the side of the nails. If you do damage your feet or injure your feet you should seek professional help immediately.. A podiatrist, or your doctor, can help the wound heal, prevent infection, or treat any infection that is present. You should not attempt to trim away unhealthy skin yourself – feet are difficult to reach and work on by yourself and it is likely l#that you will make things worse. There are many treatment options for infected or damaged feet if action is taken quickly enough but, as always, prevention is better than cure. Regular visits to your Podiatrist will ensure that your feet are kept healthy and you do not run the risk of problems leading to amputation.